Walking out to the pontoon in Sidi Bou Said marina, I get my second look at the Magellano and it reinforces the memory I had after seeing her for the first time at the Genoa Boat Show. This may not be the most beautiful boat ever designed but she is certainly striking. She has all the appearances of a small ship, which looks very much up for the job and my initial view that her lines will give a high level of confidence to prospective owners is confirmed. 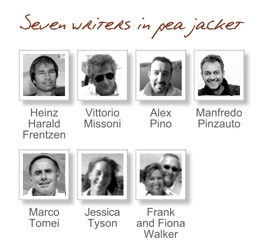 On board, once I have reacquainted myself with the highly impressive interior layout of the Magellano, it is a real pleasure to be able to talk boats and boating with Dag Pike, and his charming and very experienced crew, Alex, Jess and Marco. Inevitably our discussions centre on the Magellano and their trip around the western Mediterranean to Tunisia. 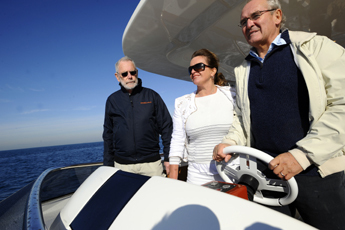 They are all impressed with the many of the features on this cutting edge new boat and in particular with the way the boat handles and it is clear, despite the type of teething problems that are inevitable in any new boat, they have all formed a strong affection for her. I want to get into the guts of the boat and Dag and the team are only too happy to run through the instruments, the systems, the engine room and the accommodation with me. I soon form the clear impression that the Magellano is without doubt, a complex and sophisticated new concept. The instrumentation, as one would expect, is comprehensive; some of it a new version of systems with which I am already familiar, some of it entirely new to me. Most of it is easy to understand if not, initially at least, to operate. The engine room is spacious but not as well laid-out as it should be. Again, not difficult to sort out and I understand Azimut are already addressing this on future 74s. …But it’s on our second day, when we put to sea, that I really get the feel for her and joy of joys, get to drive from both upper and lower positions for an extended spell. Her handling is a delight, and her full throttle turns are spectacular. She comes round hard and fast, just like a much smaller sports boat and, because of the so effective stabilisers, does so without any heel whatsoever. Very impressive, and very sure. The concept of the Magellano is all about versatility in long-distance cruising and she certainly delivers. Her sea-keeping is as good at 10 knots as it is at 20 plus and this is where she scores over both traditional displacement and planning hull boats. In this respect she is a great new concept, which should fill the market niche Azimut have identified very effectively indeed. 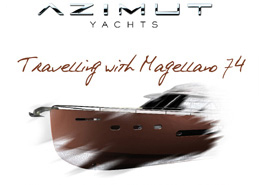 It has been a pleasure to have been involved in the early testing of the Magellano and I would like to congratulate Azimut on their courage in taking her on such a long and challenging maiden voyage and opening her out to a potentially very critical audience of journalists and experienced yachtsmen. Azimut deserve to succeed with the Magellano project and I believe they will.